This Family-Friendly Cottage sleeps 4 & has a fabulous Outdoor Pool! 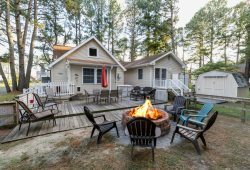 Steve`s Cottage 3 - The perfect Chincoteague Island getaway. Each Cottage sleeps 4 and has Free WiFi and Flat Screen Cable TV. All the comforts of home, with a family-friendly price tag. There is a convenient Sleeper Sofa in the Living Area. The well-stocked Kitchen makes life away from home so much easier. Everything you need to make mealtime a bay breeze...... No need to eat at restaurants everyday while you`re away.... Steve`s also has a Picnic Area with Grills and an Outdoor Pool. Each Bedroom has a comfy Queen Bed. Each Cottage is similarly decorated and so cute. Steve`s Cottage 3 sleeps 4 people comfortably. Sunny Full Bath with Tub/Shower Combo. Take a dip in the fabulous Outdoor Pool. Only 5 minutes from Assateague National Seashore. Chincoteague Island has been voted Happiest Seaside Town and Best Small Beach Town. Slack Tide - The Perfect Place to Relax & Rejuvenate on Chincoteague Island! Steve's Cottage 3 - Make Chincoteague Island Vacation Memories you'll treasure! Welcome to Steve's Cottages in the very heart of Chincoteague Island! These affordable and family-friendly Cottages have everything you need to make fabulous Vacation Memories with those who matter most. Located on a quiet street, yet close to everywhere you want to be, you can take a short stroll to the Historic District on Main Street to visit shops, restaurants, and waterfront Robert Reed Park - home of the best sunsets ever. You are also only a hop, skip, and jump from Maddox Boulevard - the Beach Road, as we call it - which is also home to some of the most popular shops and restaurants on the Island. These charming Cottages sleep 4 more than comfortably with 2 Bedrooms and 1 Full Bath with Tub/Shower Combo. Light, bright, and spacious, you will find Steve's Cottages sooooo much better than staying at a hotel! Relax in the Living Area after a fun-filled day on the Beach and enjoy the Central AC, Free WiFi, and Cable TV. Not ready to stop playing? Take a refreshing dip in the Outdoor Pool! Having a Full Kitchen during your Vacation is a total game-changer. No need to eat out every day - you have the convenience of a Kitchen with Full Size Refrigerator, Range, and Microwave Oven! Or, grill the Fresh Catch of the Day - which hopefully YOU caught - on one of the Grills provided in the Picnic Area. Dine indoors in the comfort of the AC, or at one of the picnic tables in the Picnic Area. Each Cottage has 2 Bedrooms with a Queen Bed in each and sleeps 4 people. There is also a convenient Sleeper Sofa in the Living Area. Did we mention that Steve's Cottages always come with Linens - no need to lug those sheets and bath towels along! Steve's is also absolutely perfect for a Family Reunion, or for several families traveling together, but still wishing to maintain some privacy. Seaside Vacations does not allow group rentals to guests under age 25. Therefore, online bookings for group rentals will not be honored. Steve's Cottages are located in the very heart of Chincoteague Island. Tucked away on a quiet street, yet still close to everywhere you want to be - stroll to the Historic District on Main Street to visit shops & restaurants! Only a block from Maddox Blvd. - our Beach Road - the ride to Assateague National Seashore is a sea breeze.